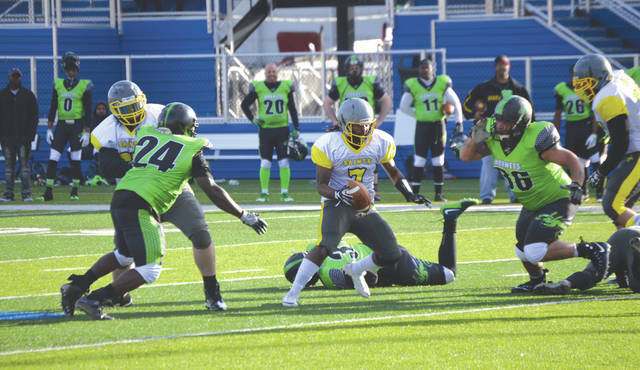 Ohio Valley Scouts quarterback Rashawn Cook (7) cuts behind a block by Saints teammate Cody Jones for a short gain, Saturday, April 7 in a semi-professional football game with the Dayton Hornets on Roger Glass Stadium’s John Q. Sherman Field in downtown Dayton. 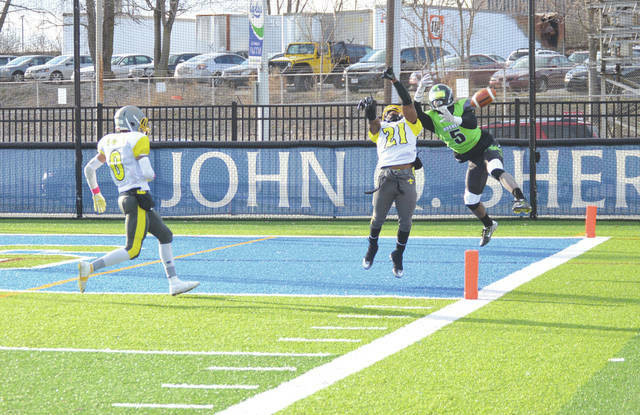 Saints defensive back Trent Williams (21) breaks up a touchdown pass attempt intended for Dayton Hornets wide receiver Nigel Faucett in first-half action Saturday at Roger Glass Stadium in Dayton. Ohio Valley Saints defenders Kyle Galyen and Chris Blair tackle Dayton Hornet wideout John Owens, as fellow Saint Willi Padgett III closes in to make the final hit, in the first half of Saturday’s semi-pro exhibition football game in Dayton. 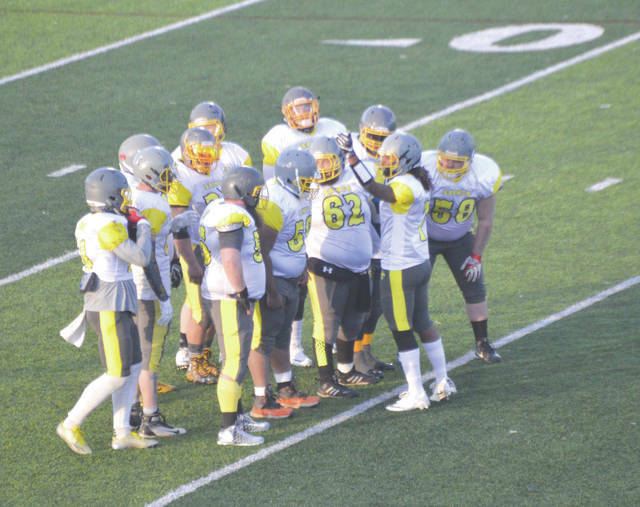 It’s why they play exhibition games: In the team’s first exhibition game, the Ohio Valley Saints found themselves with too many men in the huddle on several occasions, Saturday, April 7 in a semi-pro football game against the host Dayton Hornets. DAYTON — Given that they were playing the league favorites in their very first exhibition semi-pro football game, ever, Saturday’s April 7 shutout loss at Roger Glass Stadium felt encouraging to owner/linebacker Jordan Blair and his Ohio Valley Saints team. 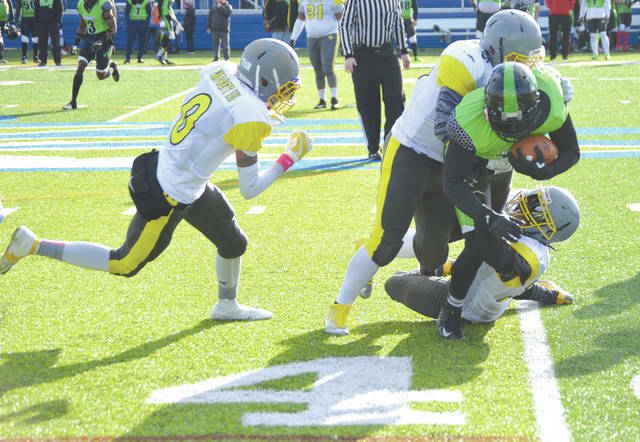 The favored Dayton Hornets were limited to one touchdown in the second half — a touchdown pass as time expired — in a 29-0 win over the Xenia-based Ohio Valley Saints. “We just gotta stop beating ourselves,” Blair said, moments after the team’s inaugural exhibition game. “We had a lot of turnovers and penalties. We’ve had a lack of practice before this game, too, so we will have two good practices coming up and then we’ve got another game on the 28th. Blair explained that, while both teams are first-year teams, a good portion of the Hornets roster comes from the Ohio Crush semi-pro team that has been in the Ohio Football League championship game three years in a row, winning the title in 2016. Some pundits figured the rookie Saints would lose by several more touchdowns to the Crush-filled Dayton squad, but solid defensive play kept physically smaller Ohio Valley in the contest. The Saints limited Dayton to 90 yards in offense for the second half, and intercepted Hornets QB Evan Sawyer twice. Former Wittenberg University standout Tristan Murray led everyone in rushing with 80 yards gained on 11 carries. The rest of the Hornets ground game was limited to 28 yards. Unofficially, Saints quarterback Rashawn Cook completed three of nine pass attempts for 53 yards, but he was sacked four times and had to chase down seven fumbled snaps, losing two of them. Teammate Christopher Reed saw action at the QB spot in the second half, finishing with four completions in eight tries for 33 yards. Willie Padgett III was the Saints’ leading receiver with two catches for 52 yards. The Saints ground game had its share of troubles against the bigger Hornets. Cook lost 26 yards while chasing down fumbles and bad snaps. B.J. Taylor led the team with 15 yards gained on four carries. With the Saints trailing throughout the contest, the passing game became the team’s weapon of choice. The Saints were flagged 11 times for 70 yards, including four penalties for having too many men on the field. The Hornets were flagged nine times for 70 yards, with three of those fouls of the 15-yard personal foul variety. Hornets coach Tony Martin credited both teams with playing well and maintaining their cool. He said Dayton had one player leave for a local hospital with a broken hand, but said both teams showed good sportsmanship during the contest. “You guys played with class, and we wish the Saints a successful first season,” Martin told both teams at midfield after the game. The Ohio Valley Saints are members of the Premier Amateur Football League. They will play their regular season home games on the artificial turf football field on the Athletes In Action Sports Complex grounds in Xenia. Their next scheduled exhibition game will be in Cincinnati. They take on the Cincinnati Gators at 7 p.m.Saturday, April 28 at Woodward High School. The Saints regular season home opener is scheduled for 7 p.m. Saturday, May 19 against the Toledo-based Glass City Tigers. That game will be played at Athletes In Action, located at 1197 S. Detroit St. in Xenia. Admission to regular season games is $5, military personnel get in for $3 and kids 13 and under get in free.